A brain tumor refers to any abnormal growth of cells in the brain. There are over 150 types of brain tumors, and the brain is a common site of metastasis (spread) of cancers from other parts of the body. Both primary brain tumors and metastases can result in bleeding in the brain and abnormal compression of normal brain structures due to the space these growths occupy. How do we diagnose a Brain tumor? Computed tomography, or CT scans, can be used to diagnose brain tumors. CT scanners use a series of x-rays and powerful computers to create 2 and 3-dimensional images of the body, including the brain. Magnetic resonance imaging, or MRI, is probably the most common and useful tool for diagnosing and following brain tumors. MRI uses a powerful magnetic field to produce images of the brain. 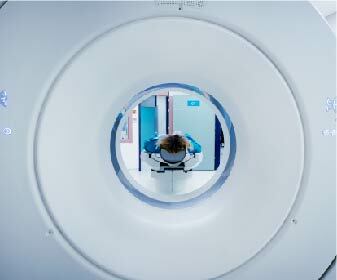 MRI does not use or produce radiation and therefore is not associated with radiation risks or effects. Ultrasound also does not produce radiation and instead uses high frequency soundwaves to image the brain and surrounding structures. Special MRI tools known as MR perfusion and functional MRI are performed at some centers and are important for differentiating brain tumors from normal tissue or irradiated brain tissue. How do we treat a Brain tumor? With there being many types of brain tumors, many different treatment approaches are required. Chemotherapy, administered by oncologists, can be used as a primary or secondary treatment for some tumors. Targeted and whole-brain radiation therapy, administered by radiation-oncologists and sometimes neurosurgeons, are also effective options for many tumor types. Often, surgery is combined with chemotherapy and/or radiation therapy, especially if the tumor is compressing other structures within the brain or has bled. Many types of nonaggressive benign tumors require no treatment at all and can be followed with periodic MRIs.